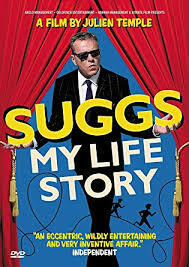 Share the post "DVD review: SUGGS – My Life Story"
Whether you are a fan of Madness or not, if you have read either of Suggs’ books (“Suggs and The City” and “That Close”) you will know he can tell a story, and here he brilliantly orates his life story from the stage, accompanied by incidental piano, interspersed with some pre-filmed footage, some old film of London, a bit of singing and, of course, a bit of the band that has made him a household name. Recorded at London’s Hoxton Hall and Shepherd’s Bush Empire, the film is directed by Julien Temple and the story starts on the day of Suggs’ 50th birthday. His favourite cat died. Not a great way to start a film I hear you say, but this actually weaves throughout the story quite well and you will no doubt be relieved to hear that he had what sounds like a cracking party at the Wilton Music Hall to mark the occasion (birthday, not dead cat). In his inimitable style Suggs talks of 1960’s Soho, the Roxy and the birth of punk, how he became known as Suggs, how he joined Madness and how they in turn found their name and more. The stories of the band’s early days, through to their first single, the notorious Two Tone tour and their new album are told in a way that only he can do- and he does this well. There is a large element of self-discovery here and without spoiling the story for you this involves a lot about his search for his long absent father, and his quest to find out more about him. There are also stories about his jazz singer Mum and of his school days. Not only does Suggs cover the success of Madness’ career, he also talks about their split and reformation, the legendary Madstock gigs of 1992 and a great Clash story that has to be heard first hand. There is also talk about his TV, radio and film work, of which there has been plenty, and this is all told with a warmth and personal touch that makes this such an engaging film. There will no doubt be some reviews you read of “My Life Story” that say this is a DVD for fans only but I don’t believe this to be the case as it is a genuinely enjoyable film. This entry was posted in All Posts, DVD REVIEWS and tagged 2Tone, DVD, film, Madness, Madstock, memoir, My Life Story, pop, review, ska, Suggs. Bookmark the permalink.